Five years ago rainwater harvesting was not even considered as a capital expenditure item on a company's capital budget, it was not even include in household building plans! For the average person on the street it meant a white pipe from a gutter into a big green tank for watering the garden. Many considered rainwater harvesting as a low cost housing item. Who wants to have an ugly green tank in your property? Today that view has changed. Having an ugly water tank on your property has become a daily necessity. The gripping drought and the deterioration of the water infrastructure has made people focus on the necessity of having water. You can still live without power for a while, but shut down the water supply and there is no alternative except for bottled water at your local supermarket. For companies the goalpost has shifted. Big manufacturing plants and water users are identifying potential risk to their business due to poor and intermittent water supply. Rainwater harvesting and having a backup water supply is not just about being green; it has become a corporate imperative that has to be included in the capital budget planning process. Water is not the cheap commodity it used to be. In South Africa water prices to commercial users have increased by 10% to 13% every year for the last 5 years. Conserving water and obtaining water from alternative sources now makes financial sense. 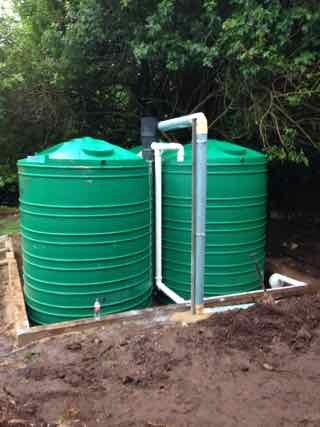 Effective designed rainwater harvesting systems can now pay back their initial investment capital in less than 5 years.